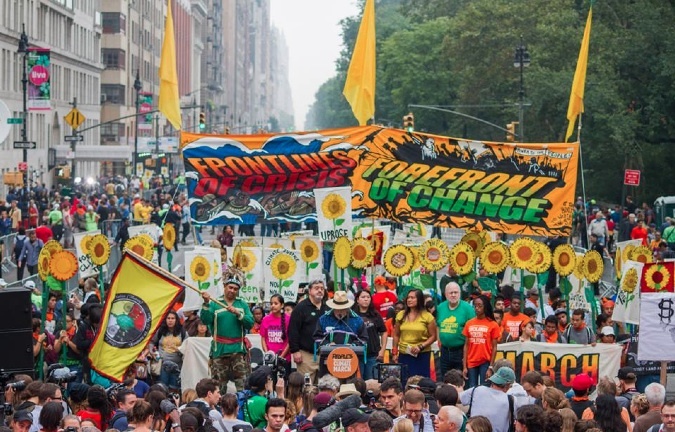 FACES is launching a campaign that connects Filipino Americans and allies to Philippine communities at the frontlines of climate change and at the forefront of climate solutions. We are excited to be partnering with two organizations: Filipino Advocates for Justice (FAJ), and the Philippine Movement for Climate Justice (PMCJ). Through our partnership with PMCJ and FAJ, FACES is on a path to explore climate solutions from the Philippines to the US and back. To meet our partners, learn more about our campaign and how you can get involved, please join us on Wed, December 3rd! Dinner will be provided. Please email Leo at leo.faces2018@gmail.com if you need a ride from the Union City BART Station. Tickets: To purchase tickets in advance, please click HERE. PMCJ is a broad coalition of organizations in the Philippines working to raise awareness and build the climate justice grassroots movement. In the weeks following Yolanda, PMCJ was one of the key groups helping with relief efforts and working with communities to demand accountability from the government and to demand a people-centered rehabilitation. FAJ strengthens the Filipino American community in Northern California by implementing civic engagement, leadership development, and youth organizing to advance social and economic justice. FACES is partnering with FAJ’s Union City office to create a community garden as a climate resiliency project and educational space. If you are unable to join us for our December 3 event, please check out FACES on Causes to learn more about our new campaign and how your generous donation will support our work. 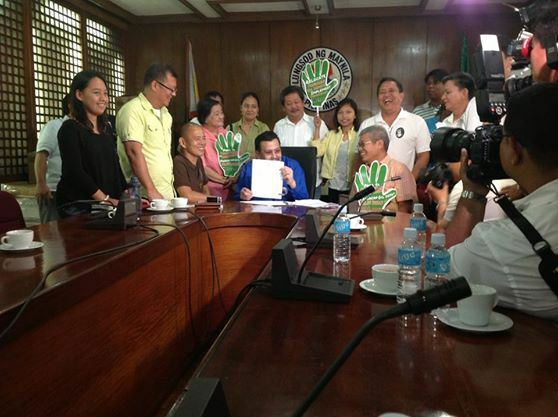 The U.S.-based Filipino/American Coalition for Environmental Solidarity (FACES) applauds the recent decision of Manila City Mayor Erap Estrada to reinforce Manila City Ordinance 8283, ordering Caltex, Shell, and Petron to submit to relocation and phase-out of the Pandacan oil depot by January 2016. Philippine civil society groups have campaigned for over a decade for the relocation of the massive oil depot out of Pandacan, where spills, leakages and fires have overwhelmed the community for years. The three oil companies have repeatedly delayed and flouted the desires of the community, church leaders, city ordinances, and a 2008 Philippine Supreme Court ruling ordering compliance to relocate the depot. While Petron has recently announced it will move out of the depot by the 2016 deadline, Shell and Caltex have yet to communicate any intentions to relocate. Mayor Estrada’s decision to uphold ordinance 8283 is a triumph for Manila residents, advocates, and community groups working for public health. FACES lauds the Mayor’s Office for engaging community members through the newly formed Pandacan Oil Depot Monitoring Committee, which will provide a strong platform for citizen involvement in the relocation. As an organization that includes environmental scientists, engineers, and community activists, FACES urges that closure of the oil depot also involve proper cleanup. FACES urges the inclusion of residents throughout the closure and relocation to ensure economic conversion plans that benefit residents, preserve green spaces, bring new jobs, and protect the environment. This past week communities across 12 countries including the U.S. and the Philippines held global actions against Chevron corporation (Caltex). In Pandacan, community members marched for the closure, transfer, and relocation of the Pandacan oil depot in an ongoing “Jericho March” action that continues Sunday May 25. Together with allies in Pandacan, we press the City of Manila and the “Big Three” oil companies for continued cooperation with the Pandacan community in relocation of the oil depots, the discontinuation of the Batangas-Pandacan pipeline operations, and compensation for the victims of the oil depot operations. As advocates for climate justice, we see the link between disasters like Typhoon Haiyan and the disproportionate impacts of climate change on our communities. 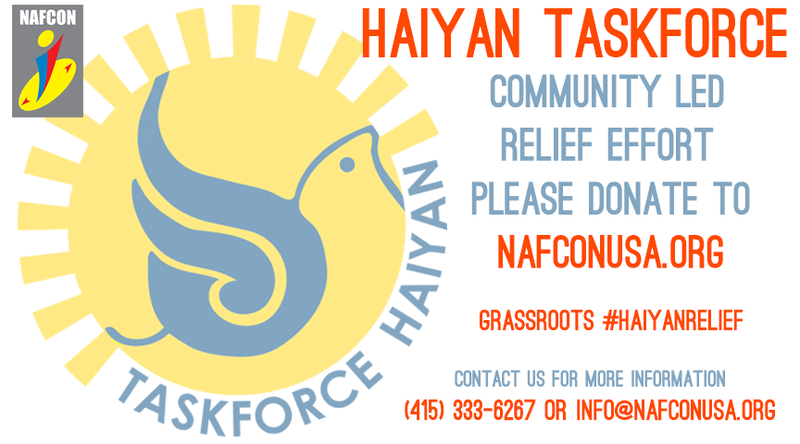 FACES asks you to join us, Filipino American leaders, and allies in the Bay Area in signing our Typhoon Haiyan Statement calling the US government to support long-term recovery in the Philippines and to commit to sound environmental policies to seriously address climate change. As a transnational environmental justice organization concerned with climate change caused by big polluters like the US and Chevron, we know it’s important that recovery in the Philippines also push forward climate justice for impacted communities. We hope to connect the incredible relief efforts going on now to the reality of climate change affecting people’s lives all over the world, and ask you to sign on to the statement as individuals and organizations. Typhoon Haiyan Statement for Climate Justice? On the statement website, you can sign as an individual with the green form, or your organization can click the link to the organizational sign-on form. FACES joined representatives from NAFCON on the November 17 broadcast of Asia Pacific Forum (WBAI 99.5 FM, NYC) sharing our critical analyses of Typhoon Haiyan and the high stakes of climate change. Click here to listen to a recording of the program online. In the wake of Typhoon Haiyan, this has been an emotional week for many of us. While the storm has passed, communities on the ground are in dire need of food, water, and medical services. You will hear many ways to give in the days and weeks ahead. Please consider joining FACES at two upcoming fundraising events–a benefit night this Wednesday, 6pm, at BUILD Pizzeria in Berkeley, and a community yard sale and space for community solidarity on November 23. All proceeds will go to Philippine typhoon relief. Pisay is a family-friendly film. It will be screened at OACC, Saturday November 16 at 4:15 pm, and at the Philippine Consulate Social Hall Sunday November 17 at 3:30 pm. The other films may not be suitable for children. This event is co-sponsored by the Center for Babaylan Studies, KulArts, FACES, Filipino Advocates for Justice, Cafe Gabriela, Friends of Akbayan, TIGRA, American Center of Philippine Arts, and Manilatown Heritage Foundation/I-Hotel. Visit Facebook event page for more information. As friends and family of those whose lives have been uprooted by Typhoon Haiyan (Yolanda), we are deeply saddened by another tragedy in the saga of natural disasters in the Philippines. 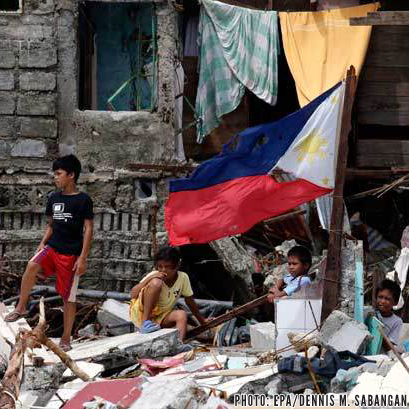 We are hopeful that communities here in the US and around the world will come together to support disaster relief in the Philippines and real solutions to end this cycle of crisis. The Philippines is one of the world’s most climate-vulnerable countries, witnessing a frightening regularity of devastating typhoons and super-typhoons like Ketsana (Ondoy) in 2009, Bopha (Pablo) in 2012, and now Typhoon Haiyan (Yolanda). Every year, thousands are displaced and countless lives are uprooted. Typhoon Haiyan (Yolanda), the strongest typhoon in recorded history, may appear to be an isolated disaster, but it is part of a continuum of ongoing crisis rooted in injustice and environmental vulnerability. Tropical storm intensity is increasing due to oceanic warming of unprecedented rates, and poorer countries are bearing the brunt of climate change caused by decades of air pollution from industry of wealthy countries. “We cannot go on like this. It cannot be a way of life that we end up running always from storms,” Saño said. FACES is beginning a climate justice campaign to connect groups in California to groups in the Philippines who are developing climate resilience programs. We already see farmers implementing sustainable agricultural practices, local communities co-managing natural resources, and states like California taking leadership in greenhouse-gas reduction. In this moment of tragedy, we also find hope. This event has revealed the real impacts of climate change being felt now, in the Philippines and all over the world. FACES calls our allies to support long-term community capacity- and resilience-building in the aftermath of Typhoon Haiyan (Yolanda) as we work together to build solutions to this cycle of environmental crisis.